Eliza Hamilton, a resident of Washington, D.C., named David A. Watterston (nephew) and Nathaniel M. McGregor (cousin) as executors. Watterston declined. McGregor filed an inventory of the estate in 1861, totaling $8,137, of which $5,950 was the value of the 11 slaves listed there. 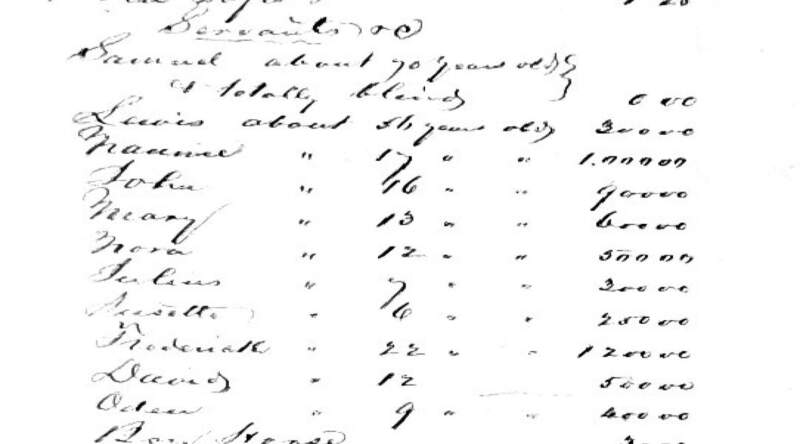 From the inventory of Eliza Hamilton's estate, 1861. Record Group 21, Entry 115, Old Series Administration Case Files, 1801-78, No. 4338, Eliza Hamilton (d.1860). Samuel (70) totally blind $0, Lewis (56) $300, Nannie (17) $1000, John (16) $900, Mary (13) $600, Nora (12) $500, Julius (7) $300, Susette (6) $250, Frederick (22) $1200, David (12) $500, Odesa (9) $400. Eliza Hamilton’s will freed all of her servants, effective at her death, and a significant portion her will is devoted to providing for them. Several are named there who do not appear on the inventory. Two of these (George and William Gray) were term slaves, promised manumission in 1857 by the 1827 will of Eliza’s aunt, Elizabeth Magruder, but apparently not yet manumitted. About the other additional names I have no information; they could have been term slaves inherited from other relatives or individuals to whom Eliza herself had already promised freedom. Freed by the will: Lewis Taylor, Sam Gantt, George Gray, Bill Gray, William Woods, Frederick Taylor, Alexander, Martha, Josephine, Josephine’s children, Martha’s children. As you see, the inventory lists a number of children individually, with no indication of parentage. Martha and Josephine are absent from the inventory. Are their children also absent? Or are these their children? Elizabeth Magruder’s will stipulated that all children born to her female slaves were to be freed at age 35. 1827+35=1862, so it’s not likely any of the people absent from the inventory fall into that category. Eliza Hamilton’s will stipulates that all of her realty was to be sold except an improved lot with two small tenements, which was to be left half to Sam Gantt and George Gray and half to the children of Martha and Josephine. She left $100 to Nannie, $600 to Lewis Taylor, $300 to his son Frederick Taylor. Interest on stock was granted for life to Betsy Beck, with George and Bill Gray as remaindermen. The will calls for creation of a trust of $3000, to be administered by D.A. Watterston for use of Sam Gantt, George & Bill Gray, Lewis Taylor, and the children of Martha & Josephine. There is no further mention of, nor provision for, Alexander. I have not yet searched the census for the Taylors or William Woods. On Jan 17, 1862, the Orphans Court required Nathaniel McGregor to show why he had not yet settled the estate. It was still not settled in July 1876 when the court acknowledged McGregor’s death and assigned responsibility to William B. Webb. So, what happened to these people? Was manumission delayed during the protracted probate? Did they get free by Emancipation in the District before this was settled? Did they get the real estate and money due them? Are you descended from these folks? Can you tell us more about their lives? National Archives and Records Administration (NARA), Record Group 21, Entry 111, Transcripts of Wills Probated, Vol. 3, p452-53, Will of Elizabeth Magruder (d.1827). NARA, Record Group 21, Entry 115, Old Series Administration Case Files, 1801-78, No. 4338, Eliza Hamilton (d.1860). Caleb Clarke Magruder, Jr., “Nathaniel Magruder of Dunblane,” American Clan Gregor Society Yearbook, 1917, pp 20-46. This summary of wills and estates of the descendants of Nathaniel Magruder (Eliza Hamilton’s grandfather) is extremely useful, but does include errors and omissions. As with any source (including this site!) be sure to check the original documents and look for corroborating evidence.